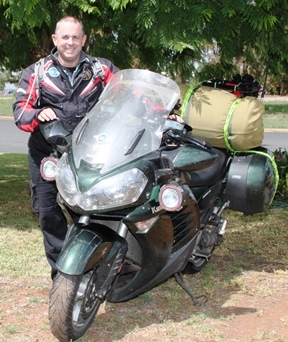 Recent Rides: In the last twelve months I have made several trans-Australia crossings. Each leg is approximately 2,500 miles (4,000 Km) and I have completed each leg within 48hrs. I had an altercation with a Kangaroo four months ago (May 2013) at highway speed approximately 50 miles (75km) from home causing over $9,500 damage to the GTR. The bike was rebuilt in about six weeks and fully operational. I have just completed (early August 2013) a 10,000 mile (16,100Km) ride in 10 days, encompassed within the ride I rode East coast Australia (Newcastle) to West coast Australia (Perth) and repeated the trip twice more completing three trans Australia, 7,460 mile (12,000Km) crossings in 6 days. Unfortunately due to circumstances beyond my control I was unable to complete my complete ride, maybe next time. On my last ride I had an altercation with a fox; I skidded for 75 meters on the roadway and it appears the bike may be written off. Since purchasing the bike 18 months ago I have put over 44,000 miles (70,000 km) on her. Wild life is a real issue particularly, Camels, Kangaroos and wombats whilst riding in our more remote areas and often we donï¿½t have mobile phone coverage to assist if required. Future Rides: I am currently working on completing a round Australia and then an East West and North South coast to coast run and hoping to average 1,250 miles (2,000Km) a day. Thatï¿½s the plan but our challenges in Australia are not only wildlife but difficulties in obtaining fuel 24hrs a day. Most remote service stations close from about 2100hrs and some due not sell premium fuel. Interesting Facts: I have just returned to long distance riding about two years ago after about 30 years abstinence and I love it. My partner often pillions for day rides and we tend to keep these under 600 miles (1,000 km).